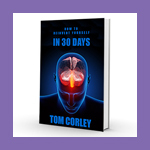 Tom Corley, bestselling author will show you How to Reinvent Yourself in 30 Days. Get this simple, uncomplicated and easy-to-use information! Get huge results in days…. Don’t wait. Reinvent yourself now!